The first thing I noticed upon opening the box is that there is no plastic packaging and no cable ties holding everything into place. I actually loved this as there is nothing worse than spending ages untangling toys with an impatient child waiting to play. Neil comes in two parts and is very easy to assemble. It is literally a 10-second job to place the handle onto the toy. This toy doesn’t require batteries to work either, which is great and also a quiet toy. 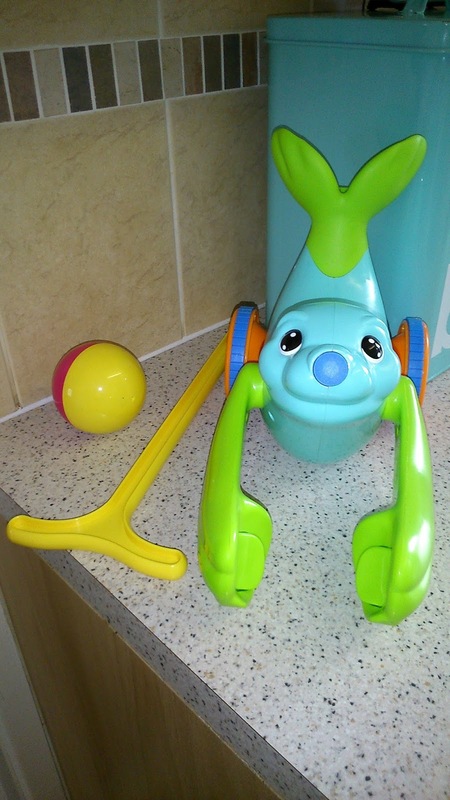 The aim of the toy is to get Neil to catch and balance his ball on the tip of his nose. To do this you simply need to push Neil along the floor. He will catch the ball in his flippers, and then will flick it up to his nose. The ball will stay in place on Neil’s nose and spins as he’s pushed along. Neil The Seal is aimed at children 18 months +. It is part of the play to learn range from Tomy. You can purchase him both instore and online for around £19.99, this is dependent on where you purchase him from. You can follow Tomy on Twitter and Facebook to find out more information about this or other Tomy toys/products. If you would like to win a Neil The Seal enter the giveaway below as we have one to give away, a winner will be chosen at random after the closing date.